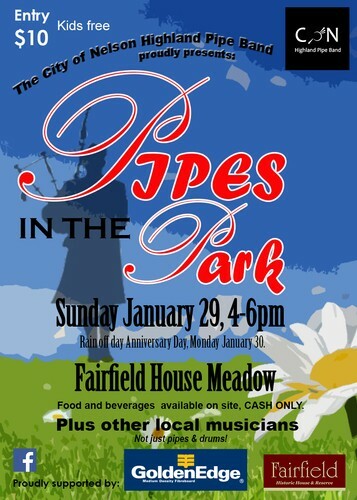 The City of Nelson Highland Pipe Band presents Pipes in the Park, two hours of Scottish music and fun in the Fairfield Meadow, with everything from traditional bagpipes and drums to singers and other musicians and even haggis! There will be food and drink available for sale, please be sure to bring cash for this. Kids are free. Pay at the gate on your way in. Bring a rug or low chair to sit on, and enjoy this one of a kind summer event! Proudly supported by Nelson Pine Industries and Fairfield House. If it is raining, this will be held on Nelson Anniversary Day, Monday January 30th, 4pm - 6pm.